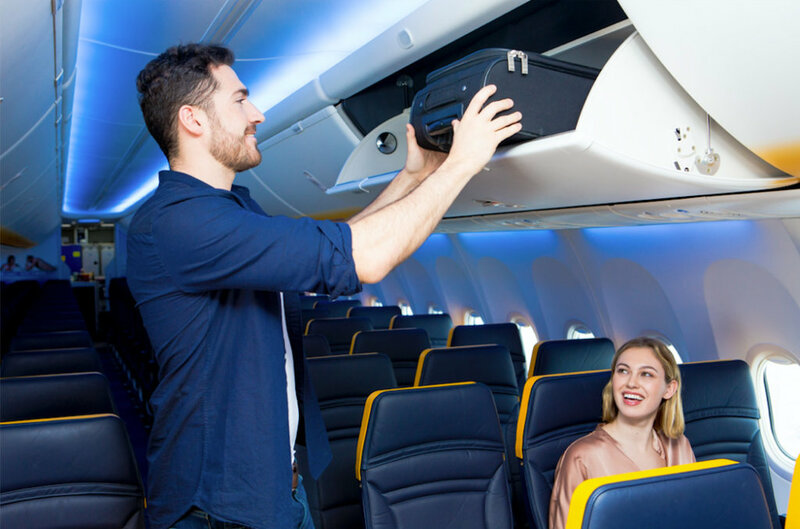 60% of Ryanair customers will be unaffected by this bag policy change, since 30% of customers already buy Priority Boarding and 30% already travel with only 1 free (small) carry-on bag. Ryanair expects that of the remaining 40% of (non-priority) customers affected by this new policy, most will either switch to priority boarding or will switch to traveling with 1 free (small) carry-on bag only, and others will buy the lower cost 10kg check bag. “From November 2018, we are introducing a new lower cost 10kg checked bag and changing our carry-on bag policy to eliminate boarding/flight delays. Priority Boarding customers will continue to enjoy two free carry-on bags. All other (non-priority) customers will be allowed one free (small) carry-on bag, and those who wish to check in a second bigger 10kg bag can do from €/£8 at the time of booking. 1.Why is Ryanair changing its carry-on bag policy? We are trying to eliminate gate bags and cut boarding gate/flight delays. 2.When is this new policy coming into effect? The new policy will go live at boarding gates on/after 1 Nov 2018 and for bookings made after 1 Sept 2018. 3.How is this different from the previous carry-on bag policy? Previously, all non-priority customers could bring 1 (small) carry-on bag and 1 bigger (wheelie) bag free of charge. The bigger bag was tagged at the gate and put in the hold (for free). This led to the tagging of up to 120 free gate bags which caused delays to 25min turnarounds. From November, non-priority customers can only bring 1 free (small) carry-on bag – there will be no free gate bags. Only priority customers can continue to bring two free bags. (1 small carry-on + 1 wheelie bag). 4. What about customers who have already booked flights before 1 September for travel on/after 1 Nov? The new bag policy will apply to all travel on/after 1 November. Non-priority customers who booked before 31 Aug, to travel after 1 November, have had a free 10kg checked bag added to their booking. Passengers who booked on/before 31 Aug but bought priority boarding (as a separate service) after 1st Sept have had the €8 cost of their priority boarding refunded but Ryanair will still allow them to travel with priority boarding free of charge. Non-priority customers who booked flights before 1 September may also cancel their booking for a full refund. 5. What are the small bag dimensions? We have increased the size of the free small carry-on bag by over 40% from 35 x 20 x 20cm (14,000 cm³) to 40 x 20 x 25cm (20,000 cm³). 6. What happens if my ‘small’ bag doesn’t fit in the sizer? 7. Have you increased the price of Priority Boarding as part of this? No, Priority Boarding which costs just €/£6 is unchanged. 8. Why would anybody pay €/£8 to check in a 10kg bag when they can buy Priority Boarding for €/£6? 9. Is this new policy about reducing delays or making more money? It’s all about reducing flight delays. We also believe that bigger bags is a service customers should pay for when our average fare is under €40. We don’t expect to make more money. Any increase in Priority Boarding and 10kg check bags will be offset by customers switching down from the current 20kg checked bag (€/£25) to the cheaper €/£8 10kg checked bag and many others will travel with just a small (free) bag. 10. How can you say 60% of customers will not be impacted? 30% of customers already buy Priority Boarding and 30% already travel with only 1 (free) small carry-on bag. Only 40% of customers are non-priority and bring a 2nd bigger free gate bag. We expect these customers will vary the baggage product they purchase depending on the type of trip they are taking. 11. Where does the small bag go on board? Small bags must be able to fit under the seat in front of you. 12. How many wheelie bags can you fit on board? Approx. 100 wheelie bags will fit in the overhead lockers which more than facilitates all priority passengers. 13. What happens if more than 100 customers want to buy Priority Boarding? They can’t – Priority Boarding is capped at 95 customers per flight (out of 189 guests). 14. What about infants; can parents still bring an extra changing bag? 15. What about customers with waivers for medical items? Medical equipment can still be brought on board free of charge subject to preclearance by our special assistance team. 16.Why don’t you make the 10kg bag free check in, if bags at gates is the problem? This would only move the problem with gate bag delays from the boarding gate to the bag drop desk. We don’t want to create long queues for customers at the bag drop desks. We believe that checked luggage is a service customers will choose to pay for or avoid as they so wish. 17. What happens if a non-priority customer comes to the gate with a wheelie bag and they have not booked it in advance? They will be charged the gate bag fee of €/£25 and the bag will be placed in the aircraft hold. 18. Is this another sneaky/hidden Ryanair charge? No, this simplifies our bag policy and improves the boarding gate experience and punctuality for all customers. Ryanair air fares have been lowered by 4% again this year so all our customers are saving. All optional extras are visible and transparent on our website. Ryanair has no hidden extras – all optional services/fees are brought to customers attention and agreed prior to booking. 19. How much extra will you make from this policy? – This revenue loss will outweigh more customers switching to priority boarding which is capped on each flight. The main objective of this policy change is to improve punctuality and reduce boarding gate delays.